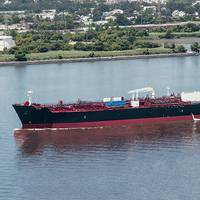 Contanda Terminals LLC, a provider of bulk liquid storage and logistics services in North America, has announced a multi-year commercial agreement with the Port of Houston Authority for 339 acres of prime deep-water access property located on the Houston Ship Channel. 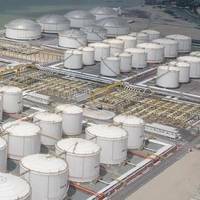 The land acquisition enables Contanda to continue to develop its key strategic business objective of doubling its terminal storage capability over the next five years, and expanding into the bulk petrochemical and hydrocarbon markets. This will further strengthen the company’s presence along the U.S.
Royal Vopak and its joint venture partners intend to expand their independent storage terminal, Pengerang Independent Terminals Sdn Bhd (PITSB) in Pengerang, Johor in southern Malaysia. PITSB will be expanded with 430,000 cbm to a total capacity of 1.7 million cubic meters.The expansion which is subject to final formalities, is expected to be commissioned progressively from Q1 2019. PITSB provides storage, blending and distribution services for crude oil and clean petroleum products. The expansion relates to the storage of clean petroleum products. 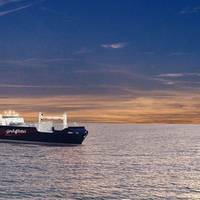 GAC UK has signed a three-year terminal and marine services deal with Valero Logistics UK Ltd. Under the agreement, from 1 February 2017, GAC UK will manage and support the discharge of 12-14MT of clean petroleum products each from up to 180 tankers a year at the ports of Cardiff and Plymouth. On 1 April, its raft of jetty operation services for the energy giant will be extended to include Avonmouth. 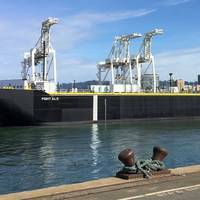 GAC UK will provide a range of terminal services including secure and safe manning of berths, ship/shore safety checks and connecting shore cargo lines to vessels’ manifolds. International energy logistics group MISC Berhad announced that it is to merge its chemical fleet with the clean petroleum products (CPP) fleet operated by its wholly owned petroleum subsidiary, AET. 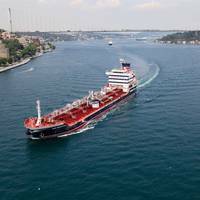 Under the new arrangement, AET will take over the 13 chemical vessels and one LPG tanker currently owned/operated by MISC and combine them with its own fleet of eight CPPs to create a new, single entity. Announcing the move, MISC President/Group CEO, Yee Yang Chien, said, “There are significant synergies to be gained from merging the two fleets and creating a consolidated products business. 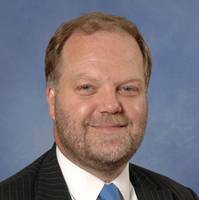 McQuilling Services has announced the release of the 2016-2020 Tanker Market Outlook. This report is a five-year outlook for eight vessel classes across 18 benchmark trades and represents the company’s 19th forecasting cycle. After over 10 years of tanker rate forecasting, McQuilling Services is a leader in the industry and continues to support a variety of stakeholders in the energy, maritime and financial services industries with its annual Tanker Market Outlook. Our full-year 2015 projection from last year’s Tanker Market Outlook tracked within 5% of actual market levels on the 15 trades forecasted. For the nine DPP trades, the original forecasts ended the year within 3% of recorded levels, while the six CPP trades ended within 7%. Marine paints manufacturer Hempel announced the launch of a new pure epoxy tank coating, Hempadur 15460, to replace its Hempadur 15400 tank coating. Hempadur 15460 is designed specifically as a tank coating for chemical vessels and is based on amine adduct cured epoxy technology, which the manufacturer says delivers resistance to continuous immersion in a range of chemicals, including crude oil up to temperatures of 80ºC/176ºF. The coating uses no toxic products and can be used to coat all liquid cargo tanks. It is also suitable for grey and black water tanks, mud and brine tanks, refrigerated seawater fish tanks and other vessel tanks. Marine transport advisors, McQuilling Services, give an insight into how they forecast the development of tanker demand, which is a constituent part of their recently published '2014-2018 Tanker Market Outlook' report. At a global level, marine transportation demand is related to world trade, which is directly related to the state of the world economy. This means that demand for crude oil and petroleum products grows with an expanding global economy. 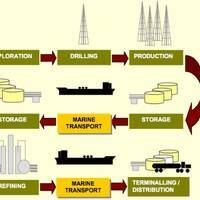 Marine transportation demand for tankers is a derived demand. It arises from the energy consumption requirements of regional economies. 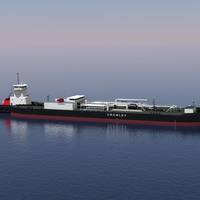 Vancouver-based Waterfront Shipping has confirmed its Methanol Carrier Project for a series of 50,000-dwt methanol carriers, each powered by an MAN B&W ME-LGI main engine running on methanol. The confirmation stems from a Letter of Intent MAN Diesel & Turbo and Waterfront signed in July of this year. MAN Diesel & Turbo officially designates the ME-LGI engine as ME-B9.3-LGI. In collaboration with leading shipping lines, Waterfront reports that it is behind the 2+1 × 6G50ME-LGI engines ordered by Westfal-Larsen, the 2+1 × 7S50ME-B9.3-LGI by Mitsui O.S.K. 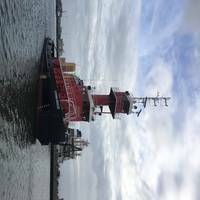 Lines (MOL), and the 1+1+1 × 6G50ME-LGI with Marinvest/Skagerack Invest. Hyundai Mipo Dockyard Co., Ltd. 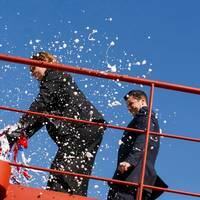 Delivery of second Aframax Vessel cements GEM’s optimistic stance in oil tanker industry. 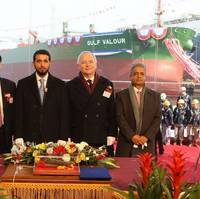 Gulf Energy Maritime (GEM) continues to expand its fleet to better serve its regional and international customers with the delivery of Gulf Valour, its second Aframax vessel. 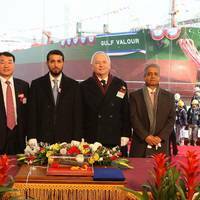 After two months since the delivery of Gulf Vision, their first Aframax vessel, GEM received Gulf Valour, which was also built by Samsung Heavy Industries. 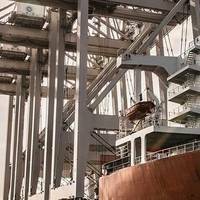 Standard Chartered arranged a Korean Export Credit Agency (ECA) to back the vessel’s financing.